Visitors to the last VDMA International Rotating Equipment Conference in 2016. The VDMA has announced a Call for Papers for the fourth International Rotating Equipment Conference – Pumps, Compressors and Vacuum Technology 2019, which will take place on 24 and 25 September 2019 in Wiesbaden, Germany. The Call for Papers is ready to download from the VDMA website and proposals must be submitted by 30 November. Once papers have been received, the programme committee will make its selection and ask the chosen authors to extend the ideas in their technical papers, guaranteeing the usual high quality standards at the conference. The programme brochure will be available in March 2019. 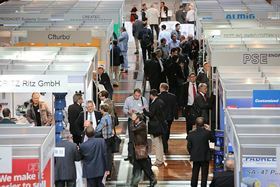 Organised by VDMA Pumps + Systems as well as VDMA Compressors, Compressed Air and Vacuum Technology, the conference will unite two forums under one roof: the 12th Pump Users International Forum and the 5th Compressor Users International Forum. There will be two days of technical lectures and an accompanying exhibition. The conference offers participants and exhibitors expert knowledge, science-based papers, a technical exhibition, details of the latest technical trends and an opportunity to exchange ideas and experiences.